Tip! Asbestos - Where Do You Look? Asbestos was a mineral product that was used in many different types of building materials. Do you know what materials most commonly contained Asbestos and may be in your home? Almost everyone has heard of Asbestos, but do you know what it is? Do you know if you have asbestos in your home? Do you know where to look? Often, in the course of work, we come across asbestos in a customer's home that they did not even know was there. In these situations, as is always the case when dealing with Asbestos, the goal is not only to limit any chance of cross contamination and exposure, but to educate as well. For more on how asbestos can impact the job process, please see our previous news story: How Can Asbestos Impact Your Water Damage Claim?. 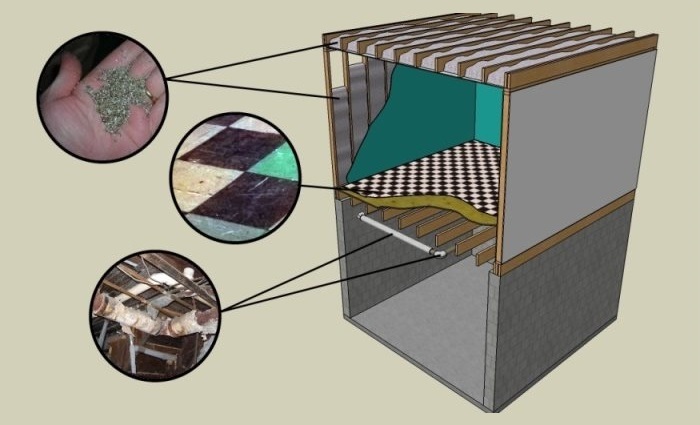 Asbestos is a naturally occurring fibrous mineral that has been used in construction materials ranging from siding to acoustical texture, and though no longer used in most consumer products was commonly used in building components up until 1989. Homes built before 1989 could have some form of asbestos. Where Do You Most Commonly Find Asbestos? Though Asbestos has been used in many building materials over the years, for the sake of this story, we are focusing on 3 common areas where we find asbestos in residential properties. Vermiculite Insulation – Vermiculite itself is not asbestos, however in some cases, asbestos was mistakenly mined along with the vermiculite itself, resulting in some vermiculite containing asbestos. 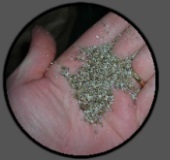 Testing is required to determine if vermiculite in your home contains asbestos fiber. 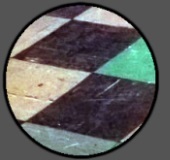 Floor Tile – Asbestos was used in both the floor tile itself as well as the black "mastic" glue used when installing these tiles. Asbestos tiles were commonly 9" x 9", but were also available as 12" x 12" tiles. Generally black "glue" under the tiles is a good indicator of asbestos in either the tiles, the mastic glue, or both. Tiles in good shape may not need to be removed, however be wary of tiles that are breaking apart, deteriorating, or otherwise becoming friable. Pipe Wrap – In basements, Asbestos is very commonly found in the form of pipe wrap, which was used to insulate pipes, or a thermal spackle-like compound used on boilers and other high-heat components. Over time, these types of asbestos insulation tend to fall apart, allowing the asbestos fibers to become airborne. 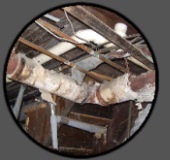 Any Asbestos Pipe Wrap or TCM (Asbestos Thermal Spackle) in poor condition should be professionally removed to prevent inhalation of these unhealthy fibers. Can Just Any Contractor Remove Asbestos? No. Most states, including Pennsylvania, require that contractors removing asbestos or asbestos containing materials be properly licensed by the state. Licensing ensures that those performing this work have undergone proper training and are able to take the necessary precautions to prevent exposure to occupants. To see a list of licensed contractors in Pennsylvania, see their list Here (Please follow the link to "Certified Asbestos Abatement Contractors"). Disaster Blaster is proudly licensed (License #: C0693A) and trained to perform Asbestos Abatement work, with a focus on residential projects. If you have an asbestos concern in your property, please Contact Us, we're happy to take a look at it for you!